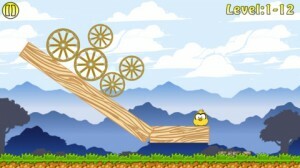 Birds and Blocks 3 is an iPhone game developed by Sprakelsoft. Featuring 80 new and free levels, Birds and Blocks 3 is a challenging puzzle game with great graphics. Birds and mobile games seem to go together like peanut butter and chocolate. In this bird-centric puzzle game, your goal is to help some adorable baby birds. Their wings are small and under-developed, and so they can’t move easily by themselves. You must help the birds reach stone blocks, which are safe. To do this, you simply tap on blocks below the bird’s body, allowing them to slowly drop down onto the safe stone platforms. The mechanics are quite similar to other physics-based games, such as Redstar Fall. In addition to safe stone blocks, there are normal, bouncy, slippery, and “lighter than air” blocks. If the bird touches the ground, you will need to re-start the level. 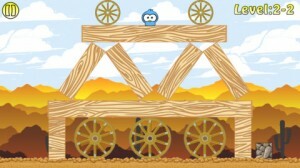 Later on, there will be wheels mixed in with the blocks, which will increase the level of difficulty. While the game features somewhat simplistic, cartoony graphics, they are full HD graphics. Birds and Blocks 3 has retina-support for iPhone 4/iPhone 5 and the iPad 3 and iPad 4. The graphics remain great throughout play time, with steady frame rates of 60 frames per second on most devices the developer has tested. The banner ads are a little annoying. However, they can be removed for a 99 cent in-app purchase. In addition, you can also spend 99 cents within the app to buy a level warp/skip. If you like Redstar Fall or other similar “dropping” physics games, the challenging blocks of Birds and Blocks 3 will definitely keep you guessing. I really liked this puzzler, and I think you will, too. 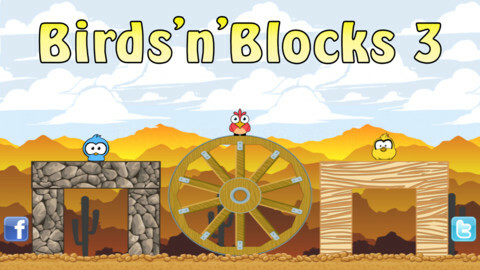 Birds and Blocks 3is compatible with iPhone 3GS, iPhone 4, iPhone 4S, iPhone 5, iPod touch (3rd generation), iPod touch (4th generation), iPod touch (5th generation) and iPad. Requires iOS 4.3 or later. This app is optimized for iPhone 5.